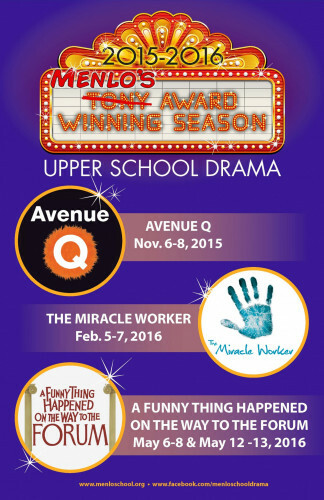 Upper School Drama Presents its 2018-2019 Season! Please visit IN THE WINGS for more show and audition-related information. The cast and crew of The Old Man and the Old Moon extend a sincere thank you to all those who continue to support the arts at Menlo! The Menlo Drama Community believes in giving back. We are so fortunate to do what we love, and it is our mission to ‘Give-Back’ both on and off stage. To date, Menlo Drama Give-Back has raised and distributed over $36,000 to various foundations, networks, and committees globally including Music and Memory, SafeSpace, Karam Foundation, Delancy Street Foundation, Polaris Project, Perkins School, Larkin Street, Mercado Global, International Rescue Committee, and One Drop Foundation. Menlo’s Upper School drama program includes courses in beginning and advanced drama in addition to producing full-length plays each fall, winter, and spring. Past productions have included Fiddler on the Roof, Avenue Q, The Miracle Worker, The Diary of Anne Frank, Little Shop of Horrors, and Urinetown. Steven Minning is the Upper School Drama Director. He has worked as a director and choreographer in New York and at theaters across the U.S. for productions such as Billy Elliot, The Lion King, Show Boat, The Will Rogers Follies, and Cirque du Soleil’s Dralion. He was the director/choreographer for major events such as the Coca-Cola Olympic reception in Atlanta and the 1994 World Cup opening ceremonies. He teaches Beginning and Advanced Acting and directs our three main stage productions.